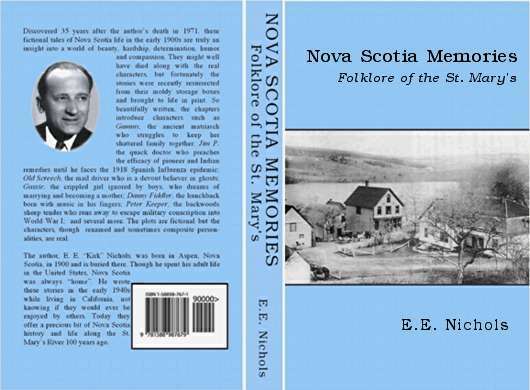 Nova Scotia History Book: "Nova Scotia Memories - Folklore of the St. Mary's"
Discovered 35 years after the author's death in 1971, these fictional tales of Nova Scotia life in the early 1900s are truly an insight into a world of beauty, hardship, determination, humor and compassion. They might well have died along with the real characters, but fortunately the stories were recently resurrected from their moldy storage boxes and brought to life in print. 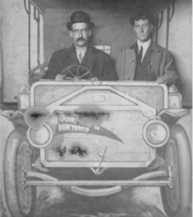 So beautifully written, the chapters in "Nova Scotia Memories" introduce characters such as Gammy, the ancient matriarch who struggles to keep her shattered family together; Jim P, the quack doctor who preaches the efficacy of pioneer and Indian remedies until he faces the 1918 Spanish Influenza epidemic; Old Screech, the mail driver who is a devout believer in ghosts; Gussie, the crippled girl ignored by boys, who dreams of marrying and becoming a mother; Danny Fiddler, the hunchback born with music in his fingers; Peter Keeper, the backwoods sheep tender who runs away to escape military conscription into World War I; and several more. The plots are fictional but the characters, though renamed and sometimes of composite personalities, are real. The author, E. E. "Kirk" Nichols, was born in Aspen, Nova Scotia, in 1900 and is buried there. Though he spent his adult life in the United States, Nova Scotia was always "home." He wrote these stories in the early 1940s while living in California, not knowing if they would ever be enjoyed by others. Today they offer a precious bit of Nova Scotia history and life along the St. Mary's River between Sherbrooke and Antigonish 100 years ago. To buy this book in ebook form, click here.